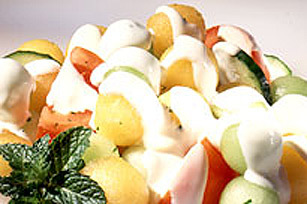 This side salad has a mix of sweet and savoury - a medley of melon, tomatoes and cucumbers tossed with a creamy dressing makes a refreshing summer side that highlights the season's bounty. MIX melon, tomatoes and cucumber in a large glass bowl. COMBINE Miracle Whip, mint and lime juice in small bowl. :To keep herbs fresh, place roots in a tall container filled with cold water and cover leaves loosely with plastic bag. Keep in refrigerator.